Bhoga Nandeeshwara Temple is a Hindu temple located in Nandi village, at the base of Nandi Hills in the Chikkaballapur district of Karnataka state, India. It is dedicated to the Hindu god Shiva. Originally built in 9th century by Nolamba dynasty, the temple received great contributions from the rulers of Ganga, Chola, Rashtrakuta, Hoysala & Vijayanagara dynasties. The temple boasts wonderful architecture and great sculptures. The large temple complex has a vast open area in front of the wonderful gateway. 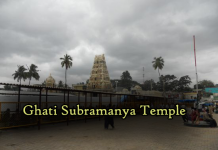 The main enclosure has three shrines dedicate to Lord Shiva known as Bhoga Nandeeshwara, Arunachaleswara and Ardhanareewara (also known as Uma Maheshwara) along with several other shrines on the rear side of the temple. The large mandapa in front of the main shrines has great art work with each pillar possessing beautifully carved images of gods, animals, puranic characters, sages and scenes depicted from Hindu mythology. 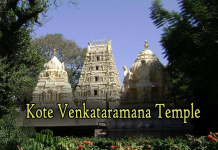 The highlight of the temple is the vasantha mandapa built in front of Ardhanareeswraa shrine. Constructed during Hoysala period, the kalyana mandapa is breathtakingly beautiful with passionately carved pillars, artistic roof and intricately carved images of Shiva, Parvathi, Vishnu, Mahalakshmi, Brahma, Saraswathi, Surya and his consort on different corners of the mandapa. The sculptures are carved with great detail and lot of caring towards every minute part of the sculptures using black granite in trademark Hoysala’s style. The outer walls of the shrine are also filled with nice carvings. The other two shrines of Bhoganandeeswara & Arunachaleswara have large mahamandapas followed by the sanctum housing Shivalingas. 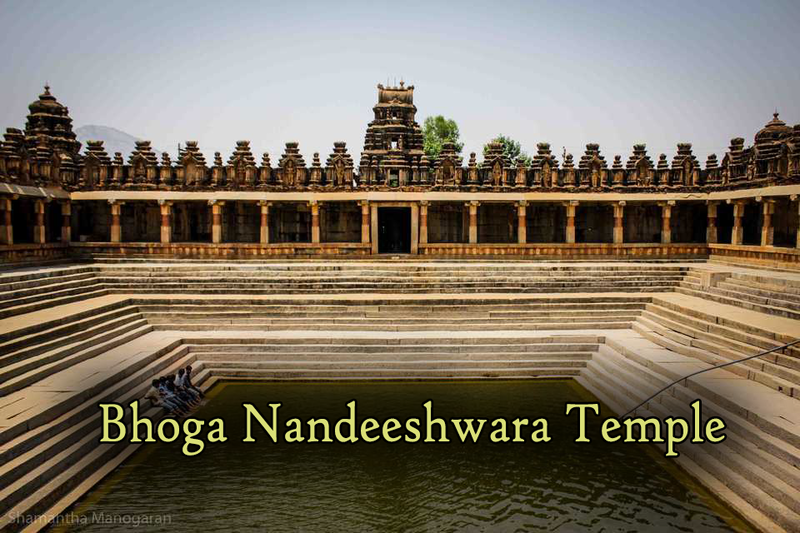 The large Nandi situated opposite to Bhoga Nandeeswara temple is nicely carved with a small mandapa. The vimana of the main shrines are small but nicely built in Dravidian style. Devi temple situated on the western side of the main shrines is worth visiting. The carvings of sapta rishis on the outer walls of these shrines are not to be missed. This shrine is popular with newly wed couples who come to seek blessing. The beautiful temple tank situated on northern side of the main shrine is a must visit. The tank has large corridors built all around the tank. The temple is currently maintained by Archeology department. Free lunch is offered to visitors of the temple.